Obverse: On the obverse is the text: «ГОСУДАРСТВЕННЫЙ КРЕДИТНЫЙ БИЛЕТЪ. ПЯТЬСОТЪ РУБЛЕЙ». (STATE CREDIT NOTE. FIVE HUNDRED RUBLES) and the text: «Государственный Банкъ размѣниваетъ кредитные билеты на золотую монету безъ ограниченія суммы (1 рубль = 1/15 имперіала, содержитъ 17,424 долей чистаго золота)». (The State Bank exchanges state credit notes for gold coin without restrictions as to the total value (1 rouble = 1/15 Imperial, equals 17,424 dols of pure gold). (dols; dolia = 44.435 mg)). On the lower left side depicted Guilloche rosette with the face value "500". Signatures of the Governor of State Bank - Ivan Pavlovich Shipov and one of the cashiers - A. Bylinsky. The Imperial Crown of Russia above the Imperial Monogram of Tsar Nicholas II of Russia with crossed laurel branches above the relief panel with the face value in large arabic numeral "500" and the date of issue "1912" at right. The Imperial Coat of Arms of the Russian Empire, 1883 - Imperial Double-Headed Eagle above the relief panel with Russian (cyrillic) text: "Extract from the Highest Manifesto of 14 November 1897, relating to the issue of state credit notes" at left. Reverse: Portrait of Emperor Peter the Great in breast armor. 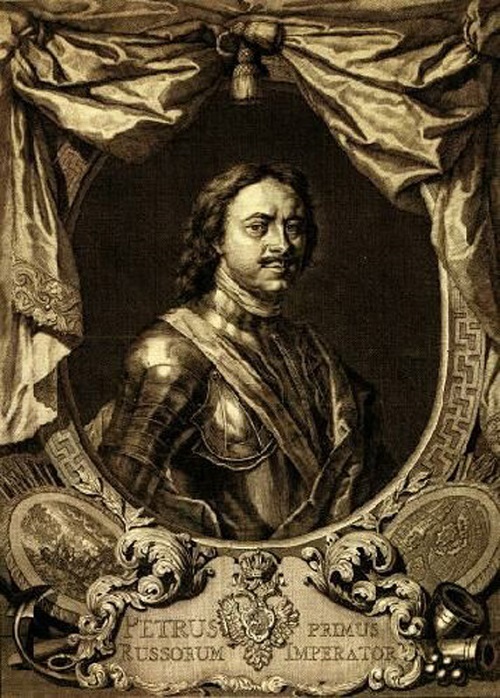 Engraving by Jacobus Houbraken (1698-1780), 18th century engraving depicting Peter the Great was made after a portrait by Carel de Moor 1718. At the top of the portrait depicted the Imperial Crown of Russia and Imperial Orb in the seashell like pearl at the bottom. A beautiful young allegorical woman wearing a laurel wreath, holding Imperial sceptre and shield at right & the face value in large arabic numeral "500" in sun flames at center. Design of the banknote consist the various architectural elements of Rococo style. Date of issue: From 1913, according to the decree of 4 August 1913. Watermark: Emperor Peter the Great. Peter the Great (Russian: Пётр Вели́кий, tr. Pyotr Velikiy), Peter I (Russian: Пётр I, tr. Pyotr I) or Peter Alexeyevich (Russian: Пётр Алексе́евич; 9 June [O.S. 30 May] 1672 – 8 February [O.S. 28 January] 1725) ruled the Tsardom of Russia and later the Russian Empire from 7 May (O.S. 27 April) 1682 until his death, jointly ruling before 1696 with his elder half-brother, Ivan V. Through a number of successful wars he expanded the Tsardom into a much larger empire that became a major European power. He led a cultural revolution that replaced some of the traditionalist and medieval social and political systems with ones that were modern, scientific, westernized, and based on The Enlightenment. Peter's reforms made a lasting impact on Russia and many institutions of Russian government trace their origins to his reign. 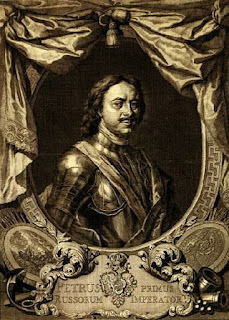 By the summer of 1689, Peter, then age 17, planned to take power from his half-sister Sophia, whose position had been weakened by two unsuccessful Crimean campaigns. When she learned of his designs, Sophia conspired with the leaders of the Streltsy, who continually aroused disorder and dissent. Peter, warned by the Streltsy, escaped in the middle of the night to the impenetrable monastery of Troitse-Sergiyeva Lavra; there he slowly gathered adherents who perceived he would win the power struggle. Sophia was eventually overthrown, with Peter I and Ivan V continuing to act as co-tsars. Peter forced Sophia to enter a convent, where she gave up her name and her position as a member of the royal family. Peter grew to be extremely tall as an adult, especially for the time period. Standing at 6 ft 8 in (203 cm) in height, the Russian tsar was literally head and shoulders above his contemporaries both in Russia and throughout Europe. Peter, however, lacked the overall proportional heft and bulk generally found in a man that size. Both his hands and feet were small, and his shoulders were narrow for his height; likewise, his head was small for his tall body. Added to this were Peter's noticeable facial tics, and he may have suffered from petit mal, a form of epilepsy. The "Grand Embassy" continued nevertheless. While visiting the Netherlands, Peter learned much about life in Western Europe. He studied shipbuilding in Zaandam (the house he lived in is now a museum, the Czar Peter House) and Amsterdam, where he visited, among others, the upper-class de Wilde family. Jacob de Wilde, a collector-general with the Admiralty of Amsterdam, had a well-known collection of art and coins, and de Wilde's daughter Maria de Wilde made an engraving of the meeting between Peter and her father, providing visual evidence of "the beginning of the West European classical tradition in Russia". According to Roger Tavernier, Peter the Great later acquired de Wilde's collection. In England Peter met with King William III, visited Greenwich and Oxford, posed for Sir Godfrey Kneller, and saw a Royal Navy Fleet Review at Deptford. He travelled to the city of Manchester to learn the techniques of city-building he would later use to great effect at Saint Petersburg. The Embassy next went to Leipzig, Dresden, and Vienna. He spoke with Augustus II the Strong and Leopold I, Holy Roman Emperor. Peter's visit was cut short in 1698, when he was forced to rush home by a rebellion of the Streltsy. The rebellion was easily crushed before Peter returned home from England; of the Tsar's troops, only one was killed. Peter nevertheless acted ruthlessly towards the mutineers. Over 1,200 of the rebels were tortured and executed, and Peter ordered that their bodies be publicly exhibited as a warning to future conspirators. The Streltsy were disbanded, and the individual they sought to put on the Throne—Peter's half-sister Sophia—was forced to become a nun. Charles XII refused to retreat to Poland or back to Sweden and instead invaded Ukraine. Peter withdrew his army southward, employing scorched earth, destroying along the way anything that could assist the Swedes. Deprived of local supplies, the Swedish army was forced to halt its advance in the winter of 1708–1709. In the summer of 1709, they resumed their efforts to capture Ukraine, culminating in the Battle of Poltava on 27 June. The battle was a decisive defeat for the Swedish forces, ending Charles' campaign in Ukraine and forcing him south to seek refuge in the Ottoman Empire. Russia had defeated what was considered to be one of the world's best militaries, and the victory overturned the view that Russia was militarily incompetent. In Poland, Augustus II was restored as King. The once powerful Persian Safavid Empire to the south was heavily declining. Taking advantage of the profitable situation, Peter launched the Russo-Persian War of 1722-1723, otherwise known as "The Persian Expedition of Peter the Great", which drastically increased Russian influence for the first time in the Caucasus and Caspian Sea region, and prevented the Ottoman Empire from making territorial gains in the region. After considerable success and the capture of many provinces and cities in the Caucasus and northern mainland Persia, the Safavids were forced to hand over territory to Russia, comprising Derbent, Shirvan, Gilan, Mazandaran, Baku, and Astrabad. However, within twelve years all the territories would be ceded back to Persia, now led by the charismatic military genius Nader Shah, as part of the Treaties of Resht and Ganja respectively, and the Russo-Persian alliance against the Ottoman Empire, which was the common enemy of both. Peter was not religious and had low regard for the Church, which he kept under tight governmental control. The traditional leader of the Church was the Patriarch of Moscow. In 1700, when the office fell vacant, Peter refused to name a replacement, allowing the Patriarch's Coadjutor (or deputy) to discharge the duties of the office. Peter could not tolerate the patriarch exercising power superior to the Tsar, as indeed had happened in the case of Philaret (1619–1633) and Nikon (1652-1666). Peter therefore abolished the Patriarchy, replacing it with a Holy Synod that was under the control of a senior bureaucrat, and the Tsar appointed all bishops. In 1721 Peter followed the advice of Theophan Prokopovich in designing the Holy Synod as a council of ten clergymen. For leadership in the church, Peter turned increasingly to Ukrainians, who were more open to reform, but were not well loved by the Russian clergy. Peter implemented a law that stipulated that no Russian man could join a monastery before the age of 50. He felt that too many able Russian men were being wasted on clerical work when they could be joining his new and improved army. He took Martha Skavronskaya, a peasant, as a mistress some time between 1702 and 1704. Martha converted to the Russian Orthodox Church and took the name Catherine. Though no record exists, Catherine and Peter are described as having married secretly between 23 Oct and 1 Dec 1707 in St. Petersburg. Peter valued Catherine and married her again (this time officially) at Saint Isaac's Cathedral in Saint Petersburg on 9 February 1712. In early January 1725, Peter was struck once again with uremia. Legend has it that before lapsing into unconsciousness Peter asked for a paper and pen and scrawled an unfinished note that read: "Leave all to ..." and then, exhausted by the effort, asked for his daughter Anna to be summoned. Peter died between four and five in the morning 8 February 1725. An autopsy revealed his bladder to be infected with gangrene. He was fifty-two years, seven months old when he died, having reigned forty-two years. Ivan Pavlovich Shipov (1865–1919) was an Imperial Russian politician. After graduating from the Imperial Alexander Lyceum, he entered the Ministry of Finance. He rose to the position of Assistant Director of the Special Credit Office, and was eventually Director of the General Office (Ministerial Chancellery). In addition, he served on the Board of the State Bank in 1902–1905. In 1905, he was appointed Minister of Finance during the Witte government. In 1906, he left that position when Witte resigned, due in part to his long association with Witte. The circumstances of Shipov's death are uncertain, but seem to coincide with many political arrests and executions by the Bolsheviks in 1919. Jacobus Houbraken (25 December 1698 – 14 November 1780) was a Dutch engraver and the son of the artist and biographer Arnold Houbraken (1660–1719), whom he assisted in producing a published record of the lives of artists from the Dutch Golden Age. Jacobus was born in Dordrecht, and learned the art of engraving from his father. In 1707 he moved to Amsterdam, where for years he helped his father with his magnum opus, his art historical work The Great Theatre of Dutch Painters (1718–1721). When his father died he assisted his mother with the last proofs of the manuscript before publishing. With this project he started his portraits of Netherlandish celebrities, that are today in many cases the only likenesses left of these people. He was influenced by studying the works of Cornelis Cort, Jonas Suyderhoef, Gerard Edelinck and the Visschers. He died, aged 81, in Amsterdam. Houbraken devoted himself almost entirely to portraiture. His work became famous through his collaboration with the historian Thomas Birch and artist George Vertue, on the project entitled, Heads of Illustrious Persons of Great Britain, published in parts in London from 1743 to 1752. After that, during the years 1752–59 he worked with the historian Jan Wagenaar (1709–1773) on his 21 part Vaderlandsche historie, working for the publisher Isaac Tirion in Amsterdam. With this project of biographies of celebrated figures, he annotated his work with notes about the original paintings. Among his best works are scenes from the comedy of "De Ontdekte Schijndeugd", executed in his eightieth year, after Cornelis Troost, who was called by his countrymen the Dutch Hogarth. Houbraken also engraved the portraits for Jan van Gool's Nieuwe schouburg der Nederlantsche kunstschilders (Den Haag, 1750–1751). His oeuvre of more than 400 portrait engravings form an important record for art provenance. His portraits were often set in an oval frame, with a subtitle with the subject's claim to fame. Under that in small letters, he placed his notes about the original oil portrait. Carel de Moor (25 February 1655 – 16 February 1738) was a Dutch Golden Age etcher and painter. He was a pupil of Gerard Dou. Carel de Moor was born in Leiden. According to Houbraken, his father was an art dealer who wanted him to study languages and only allowed him to study art when his talent for drawing surfaced at a young age. Houbraken met him in person at the atelier of Godfried Schalcken when he was completing his education there. According to the RKD he was the son of a Leiden painter of the same name and a pupil of Dou, Frans van Mieris, Godfried Schalcken, and Abraham van den Tempel. He became a member of the Leiden Guild of St. Luke in 1683, and became deacon many times over in the years 1688-1711. His own pupils later were Pieter Lyonet, Andrei Matveev, his own son Carel Isaak de Moor, Arent Pijl, Arnout Rentinck, Nicolaas Six and Mattheus Verheyden. He died in Leiden or Warmond.